So that happened. After weeks and weeks of talk, hype, waiting, and prognosticating the 83rd Academy Awards were handed out last weekend. For the awards themselves, there were no surprises. To steal a sports metaphor from March Madness, it was chalk all the way (the expected winners winning). On the whole though, the show was all right and I was entertained well enough. Here’s a few of my thoughts on the show, starting with the Best Supporting categories since I didn’t get around to posting those before the show . 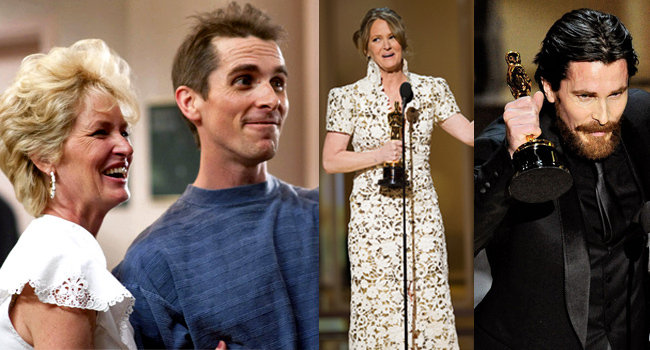 . .
Melissa Leo and Christian Bale struck Oscar gold for their roles in The Fighter. The Fighter was definitely recognized as one of the best films of 2010 with both Christian Bale and Melissa Leo sweeping the Supporting category. I didn’t have a problem with either of these two awards. Melissa Leo was far and away best in that category (sorry, didn’t get a chance to see Jacki Weaver in Animal Kingdom–though I did hear her performance did rival Leo’s), even better than her co-star Amy Adams. Christian Bale on the other hand I thought had stiffer competition in the Best Supporting Actor category. Bale was still my pick going into the show, but I also thought Geoffrey Rush was right up there with him and was probably a close second. John Hawkes had an outside shot at winning it giving really strong performance as the terrifying uncle in Winter’s Bone and Mark Ruffalo was also generating some buzz as the ‘oh-so-cool’ sperm donor dad from The Kids Are All Right. As with most of the night, both these categories went pretty much as expected. This year was the first year that I saw the Oscar nominated shorts, both live-action and animated, and I was pretty entertained by all of them. I’m not sure what the criteria on time length for this section is, but each film did a good job of telling a complete story. 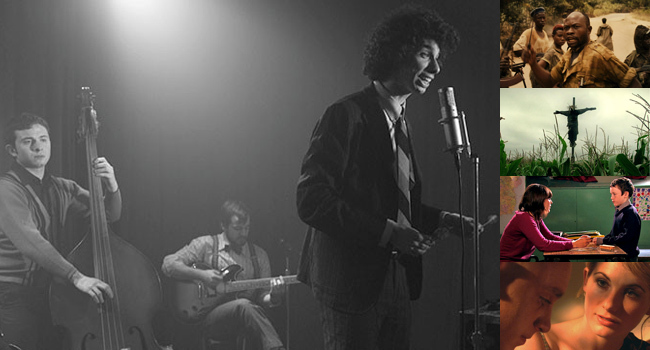 God of Love out sang the competition in the Live Action Shorts competition. Other nominees top to bottom: Na Wewe, The Confession, The Crush, Wish 143. For the live action Oscar shorts, four of the five nominees were on the serious side with eventual winner, God of Love, being providing a lighter comedic fare. I think what surprised me was just how engrossing each of these shorts were. They really were mini-movies that told a complete story in a short amount of time. If I would have had to pick one, I guess it would have been Na Wewe; as it captivated me in the most. I can see why God of Love won though, it was definitely well shot, edited, and a fun film as well. 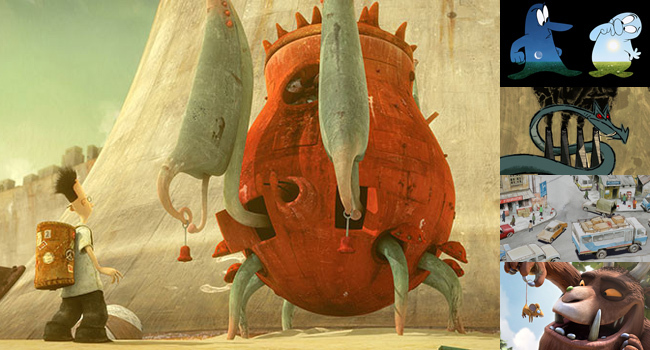 The Lost Thing hit paydirt in the Animated Short competition. Other nominees top to bottom: Day & Night, Let's Pollute, Madagascar, The Gruffalo. For the animated shorts, what I liked best about this category was that each nominee had a different style of animation. On one side you had the high end and commercial entry from Pixar with their Day & Night short and on the opposite end you had impressionistic style of Madagascar. Again, as with the live action portion, it was hard for me pick a favorite, but Day & Night, The Gruffalo, or The Lost Thing were the three out of the five that I thought were the best. Day & Night is just Pixar hitting another home run so a win for them would have been fine. Thankfully however, the Academy spread the wealth around (as Pixar won for the feature length category with Toy Story 3) and awarded the Oscar to The Lost Thing. What I liked about The Lost Thing was the anime animation style and the sci-fi tinting of it’s story. I think it was the unexpectedness of this sci-fi type of short winning that made me happy that it did win. 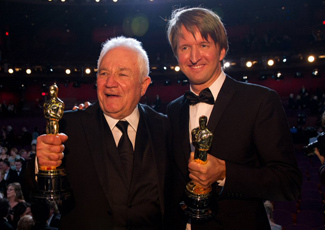 Screen writer David Seidler and director Tom Hooper celebrate Best Picture winner, The King's Speech. Ok, I’ll admit it. I was a little disappointed that my pick The Social Network didn’t snag either of the awards for Best Picture or Best Director. If it had gotten either of those awards, I would have been a little more ok with how things turned out. Don’t get me wrong, The King’s Speech is great (and probably my #2 movie for 2010), but I thought The Social Network was a better film and a better directed one as well. Oh well, nuff said. The Academy & ABC :: Was it just me, or did anyone else think having an ABC exec and someone from from the Academy coming on stage to announce that ABC had renewed it’s contract to carry The Academy Awards for the foreseeable future a little awkward and out of place? I know it was a short piece and didn’t take too long, but was it really necessary? What makes it ironic is that apparently after the Oscars it was determined that the ratings for this year were down 10% from last year and the drop in viewership from the 18-49 demo were even worse. Talk about bad timing, the Academy renewed it’s contract with ABC, when ABC just produced and televised the lowest rated academy awards in seven years. I hope this isn’t a foreshadowing of Academy Awards broadcasts to come. The Hosts :: I thought Anne Hathaway and James Franco did a decent job of hosting the awards. I know that a lot of people thought that Franco looked ‘disinterested’ or ‘on something’ most of the time, but I didn’t really care about that. To me the hosts are just gravy and if you get good gravy great, if you get bad gravy–who cares. I mean, when you really think about it, they’re not on screen for much of the show anyway so to me, it’s not that big of a deal. One thing that Franco did that was cool though was to tweet and shoot behind the scenes video during the show. I didn’t know it was going on at the time, but checking on some of the stuff he posted was kind of interesting. What I’m a little surprised by is that the producers, the powers that be, or whoever thought it was a good idea to have them host; thought so because they’re younger and would draw in younger eyeballs. I really don’t know how they came up with this correlation. Younger hosts do not equal younger viewers. If you look at Hathaway and Franco’s filmography you’d see that the films they make definitely cater to an over 30 audience. The ‘Hipness’ of It All :: There were two bits during the show that I thought were genius that apparently a lot of other bloggers and movie media types didn’t like: the opening montage where Hathaway and Franco were inserted into some of the Best Picture nominees and the auto tune segment where a few films from 2010 got songified. I thought they were both funny and entertaining and lightened the mood of the show. What can I say, I’m a sucker for those MTV spoofs and the work of the The Gregory Brothers (the Auto Tune the News guys). Franco and Hathaway dialed up Doc Brown, Marty McFly, Morgan Freeman, and Alec Baldwin in the Academy Awards opening montage.